The call came at 3:00 pm. I thought he was joking ... but he's not exactly the joking type and his voice didn't sound like he was joking. Apparently he was serious. One of the two pieces I put in the "Water: Source of Life" exhibit had sold ... my first real sale. I'm still having a little difficulty understanding that someone actually paid for something I so enjoy doing. But, I guess this now means that I am a "professional" artist ... what fun. 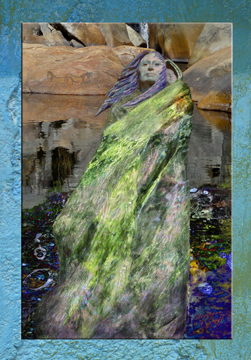 About the image: "Spirit of Water" ... this is the digital collage that sold. You make art. You're an artist! And that collage is awesome. The collage is awesome -- and you go girl!!!! Nor surprised it sold....It's AWESOME!